And what about some oven-fried ones? Oh, you need to know some more about them to be able to decide. Alrighty, I’ll be glad to tell you. 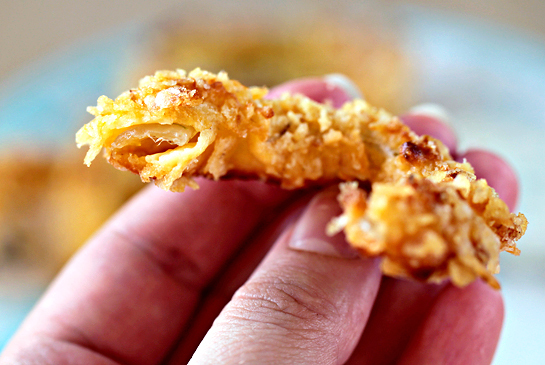 These onion rings are crunchy, flavorful and very delicious. 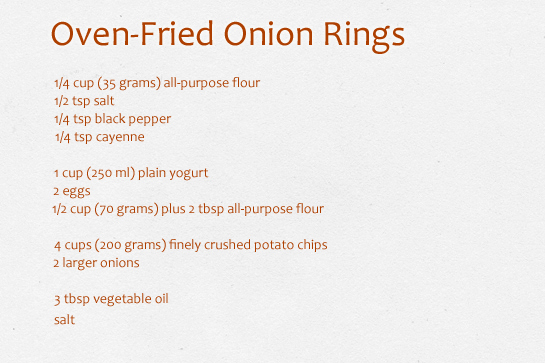 The tempting potato chips coating, full of spicy flavor, is a nice contrast to the tender and sweet onions. And since the chips have been fried, they give the onion rings that unique deep-fried taste even though there’s no deep-frying involved. 1. Preheat the oven to 390 F (200 C). 2. 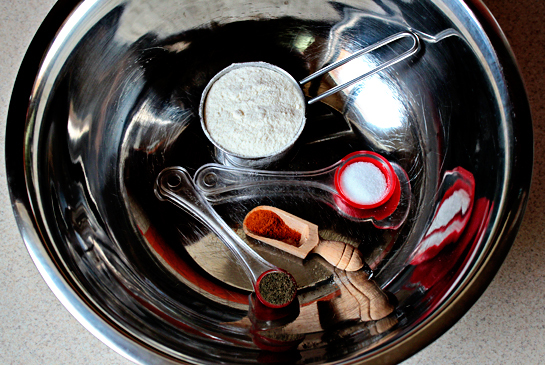 In a large bowl, combine 1/4 cup (35 grams) flour, 1/2 tsp salt, 1/4 tsp black pepper and 1/4 tsp cayenne. Minus the spoons. 3. In another medium bowl, combine the yogurt, eggs and 1/2 cup (70 grams) plus 2 tbsp flour. 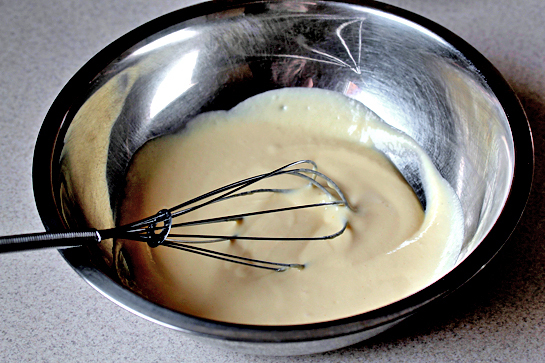 Whisk until a smooth batter is formed. 4. Crush all the chips finely and place them in a bowl too. 5. 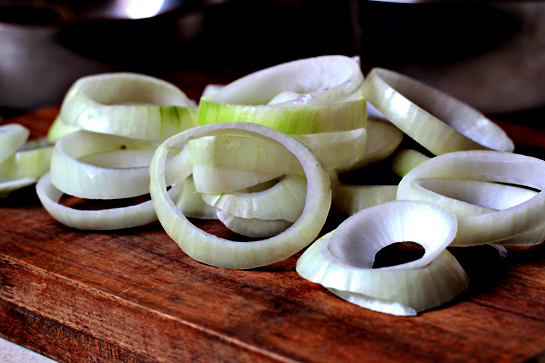 Peel the onions and cut them into 1/2 inch (1 cm) rings. 6. 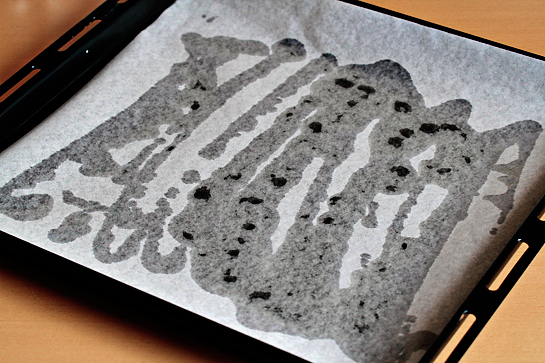 Cover a baking sheet with a piece of parchment. 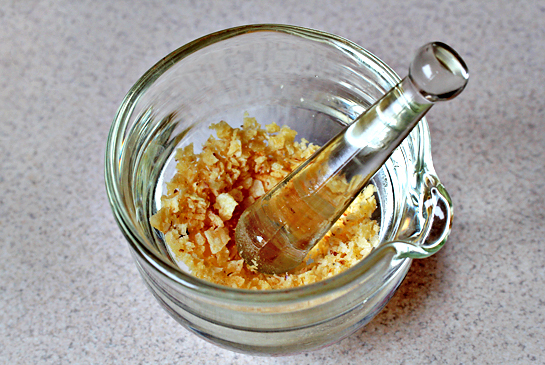 Drizzle with 3 tbsp vegetable oil, then pop it into the hot oven for 8 minutes – or until the oil just starts to smoke. 7. 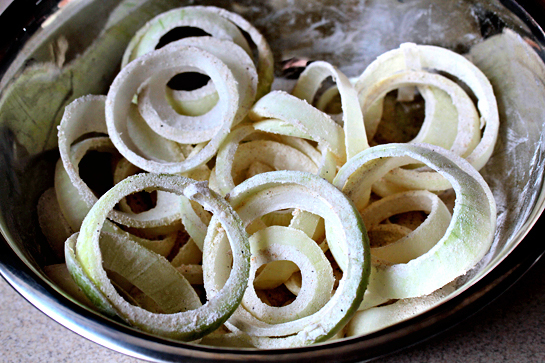 In the meantime, toss the onion rings in the flour mixture. 8. 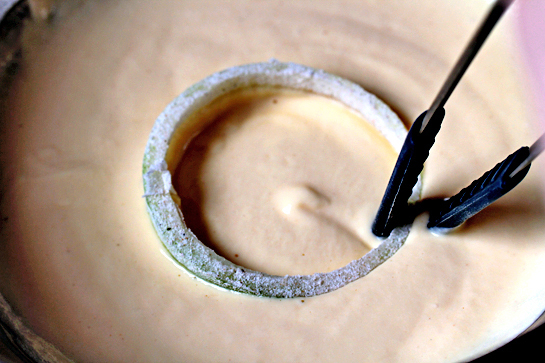 Dip each ring into the batter. Let the excess batter dribble off a little. 9. Then coat the rings with the crushed potato chips. 10. Place the rings on the hot baking sheet and bake for 8 minutes, then flip each ring over before baking for another 8 minutes. Since you will probably have more rings than you can fit in one baking sheet you might need to work in batches. 11. Sprinkle with salt while the rings are still hot. 12. 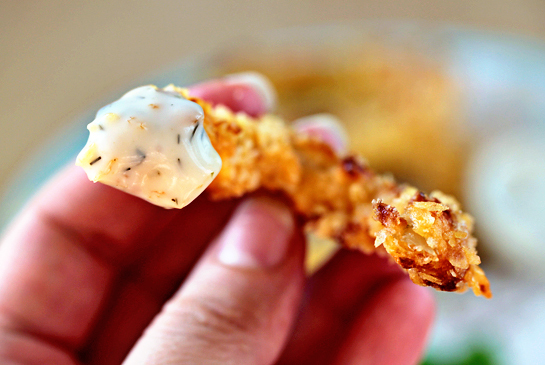 Serve with your favorite dipping sauce. I’ve used a lovely yogurt herb one. Crunchy around, soft and sweet in the middle. Yum-yum. Beautiful!! You’ve inspired me to make them again. They are so darn good. 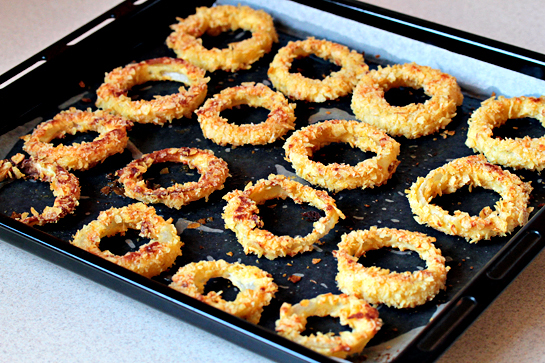 i love onion rings, never tried them in the oven! These are lovely! 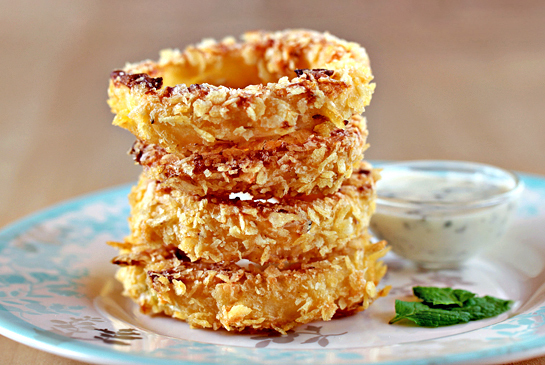 I looove onion rings and these just look amazing! So much better then deepfried. Definitelly going to try. Im on a diet, and Im sure these can be eaten LOL! I want to have a whole bunch of these, so so super delicious. Oh yea, Oven friend, less calories, I’m so on it, can I use whole grain bread for the crust and potato starch? Greaat photos , as usual. I bet it tastes as good as it looks! Great idea coating it with potato chips! Has anyone tried this with the Lay’s Light Potato Chips which are fat-free? That would definitely cut down on the fat and would be even more guilt free! Totally going to try this with Panko! Although chips sound so much naughtier. Thanks for the inspiration! These look soooo good! 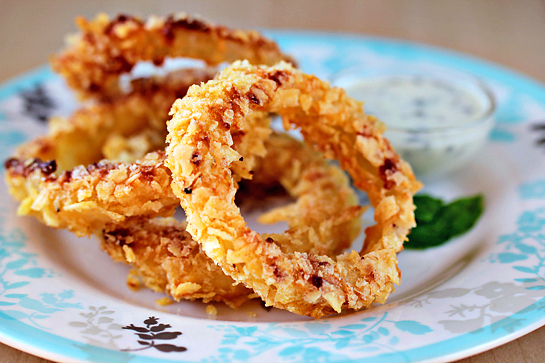 And healthier way to eat onion rings too. YUM! Oh my goodness, I made these a few nights ago and they are insanely good. Very decadent! 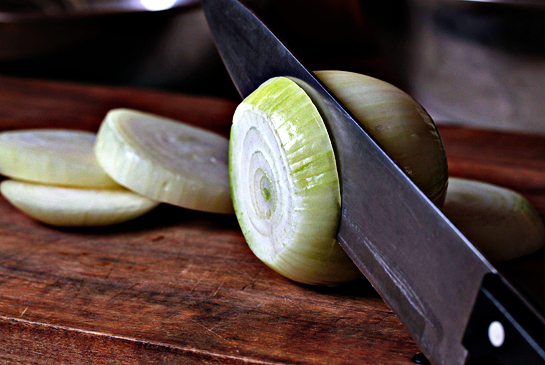 I ran out of crushed chips before I ran out of batter and onions – I think I should have crushed them even more finely. And my batter was pretty thick, I probably should have thinned it out a bit (maybe with milk?). i tried it and it tasted yummy! However, i had trouble coating the crushed chips onto the onion rings. May I know why did it happen? Does anyone know if these can be made with gluten free flour? My son has celiac disease so I couldn’t use regular flour. can you substitute sour cream for the yogurt? These did not work for me at all! 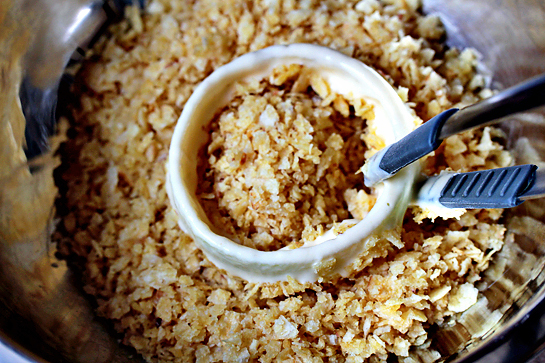 The crumbs got all stuck to the tongs as the batter ended up mixed in after the first few. The clumping of the crumbs meant the rings didn’t end up coated. The ones that I did get in the oven (I had dumb the second half because the coating was so gobbed up and I was frustrated) didn’t crisp up at all and then the flavor of the potato chips with the onion was really weird. These didn’t come out anything like the picture and I followed the directions and the recipe 100%! These were great! The crust adhered very well. I had to make a change and sub sour cream for the yogurt batter but it worked fine after I added just a splash of milk to loosen it up. I’m sure it was my fault not the recipe. Mayo would probably work, too. Really terrific recipe. I’m posting it on Fb in a cooking forum I belong to. Of course, I will link back to your wonderful blog to give credit where it’s due!